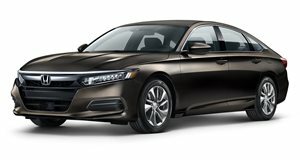 Honda cares about the enthusiasts, which is why it’s given the Accord Sport a choice between two engines, both of which are available with a six-speed manual gearbox at no cost. 19-inch alloy wheels, a rear spoiler, chrome exhaust tips and LED fog lights complete the look, while inside there’s bespoke upholstery, a leather-wrapped steering wheel and simulated leather upholstery, to complete the sporting aesthetic. The Sport also gets increased infotainment functionality, including Apple CarPlay and Android Auto and eight speakers. The Accord Sport is one of our top picks, with the 2.0T engine and a manual gearbox.